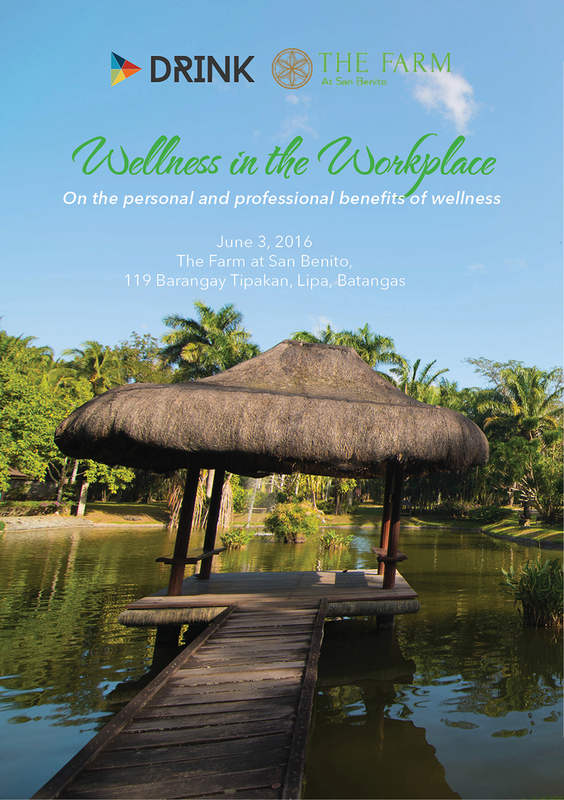 Wellness at Work – An upcoming roundtable discussion, to be held in partnership with The Farm at San Benito, on the value of wellness in boosting employee engagement and best practices to achieve holistic wellness in and out of the workplace. Health is wealth. More and more companies are investing in wellness and employee engagement as they see their benefits to business sustainability. We are inviting professionals to join us in Wellness in the Workplace, a Drink Ideas roundtable discussion on the benefits of wellness to your organization and people, and industry best practices. Sustainability experts from Drink and health experts from the Farm will lead the discussions on holistic wellness and healing practices in and out of the office. The Farm also prepared various samplers for guests so we can explore the various aspects of wellness. We want you to join us on this journey towards improving our personal and professional lives. Please see the poster for quick information and for full details, email us at camille@drinkartworkstation.com and we will send you an invitation along with the event program.